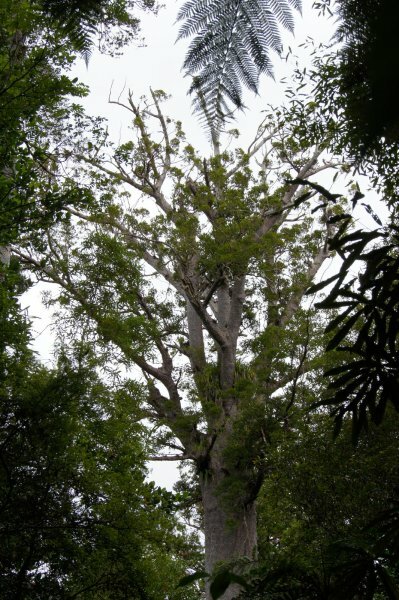 Rakaunui was the 4th largest tree in the Omahuta kauri sanctuary when it was formed in 1951, but is now the 2nd largest tree, after Hokianga (NR/0803), since the fall of the Kopi and Taniwha trees. The neighbouring lower Ngatuahine "Sister" tree has also recently fallen, clearing out some of the forest in front of Rakaunui, providing an impressive view of the tree, but exposing it to further risk of wind-throw. The name of the tree is a back-translation of "rākau nui", or "big tree". "Rākaunui" in Te Reo actually translates to "full moon". 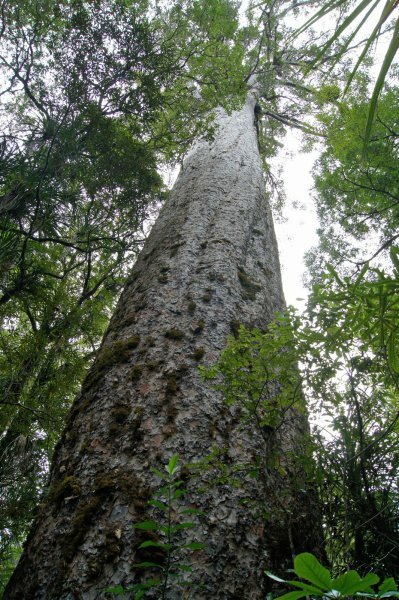 The girth of the tree was not directly measured, to protect the delicate shallow feeding roots of the kauri and to reduce the risk of contamination by Kauri die-back disease. The 1971 New Zealand Forest Service measurement, reported by Sale, was used. Reference: E. V. Sale, Quest for the Kauri, 1978. Highest top was dead wood. Highest live foliage was at 47 m.
Significant dead wood in the crown shows that the tree is in decline. The sanctuary is reached by a narrow unsealed road from SH1 a few kilometres south of Mangamuka. It is very important that footwear is clean and disinfected and to keep to the walking track at all times. Kauri have very sensitive surface roots, and foot traffic around the trees endangers their life span and may potentially spread the PTA disease that is threatening them. The track around the sanctuary runs right past the tree.